Cracking the Century – Almost There! Okay guys, I’m at 100 downloads for “Unquiet Slumbers for the Sleepers” and 98 for “In That Quiet Earth”. Anyone who hasn’t got them yet, remember they’re completely free, just follow the links and lets push these babies well over 100! Okay guys, I’m at 95 downloads for both my books – “Unquiet Slumbers for the Sleepers” and “In That Quiet Earth”. Anyone who hasn’t got them yet, remember they’re completely free, just follow the links and lets push these babies over 100! Much like his first collection, , Alex C. Telander’s new short story collection, “In That Quiet Earth,” runs the gamut of genres, showing his extensive breadth and range as writer. Readers will not be disappointed and will find a number compelling storylines and complex characters to become engaged in reading about. The collection kicks off with a short piece exploring a man who is changing in a way he doesn’t want to. “The Lonesome Road” is one of the first stories Telander wrote, and goes into depth about the security we feel in everyday life, and what happens when that is suddenly taken away. Some other interesting stories include “Outside the Chamber,” exploring the role of Nazis charged with gassing victims, to a classic fantasy tale in “The Adventure of Lem, Odo and Tom,” and ending with “Motion in Motion,” a unique stream of consciousness story unlike any other. The collection also features two sneak peeks at two of Telander’s future novels. The collection is a broad and fascinating one, providing something for everyone, leaving readers at the end wanting more and waiting for Alex C. Telander’s next work. To download the ebook in any format, click HERE or the cover above. I’m going to be totally honest with you. I got my dates mixed up and thought April 22nd was a Tuesday, which was when I was planning to release my next book, and it’s actually this coming Sunday. But that’s okay, I’ve got the manuscript all ready, and as promised, the book, In That Quiet Earth, featuring ten short stories by yours truly, will be up and available in ebook to download for free come Sunday morning. And here is the final cover for my second collection of short stories, In That Quiet Earth, that I will be publishing in April, maybe even possible April 17th, if everything goes accordingly. For now, enjoy the colorful cover! It’s interesting what the change from one month to the next can bring. Up until the end of March, my writing for 2012 consisted mainly of one particular project, but now with the onset of April and some preset deadlines for other projects, I find myself with three different projects going at once, which in my opinion is great, because while working on one book can certainly be enough to drive the writer each and every day, sometimes he or she isn’t feeling it and needs to work on something else, which is why it’s good to have — to use a cliche — a number of irons in the fire. Here are my three irons going right now . . . all heating at various temperatures, some glowing with great heat, others just beginning to warm up; in the burning fires of my imagination . . . sorry, had to do that. Iron #1: Wyrd: This is the historical fiction manuscript that I’ve been playing around with for a long time now . . . by next year it will have been ten years since I started thinking about it and do some initial writings. I’ve been seriously working on it, writing it, for the last two years and it’s currently over 83,000 words, and while on my word count meter this shows as over halfway, I honestly don’t actually think I’ve reached that point yet. This is the book that’s been my sole project so far this year, and my goal is at least to make it to page 500, and I’m currently a handful of pages away from 400, so on target there. Iron #2: In That Quiet Earth: Some time in April — right now I’m tentatively saying April 17th — I will release my second collection of short stories, called In That Quiet Earth. Like Unquiet Slumbers for the Sleepers, it will also be ten stories and feature the first two sample chapters to two of my novels. I do have the cover now which my wife it working on titling and once that’s all set I’ll be releasing that for people to see. And hopefully the ebook will be available April 17th, but we shall see. 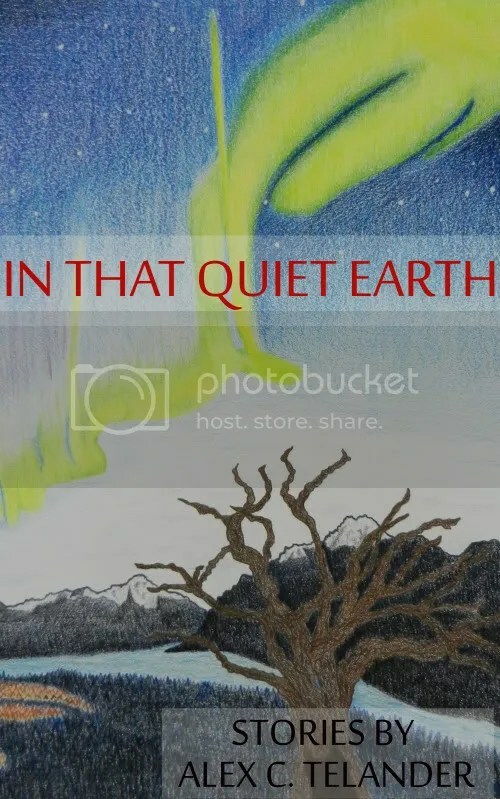 Also, like Unquiet Slumbers for the Sleepers is now, In That Quiet Earth will also be offered as a free ebook to entice readers to check out some of my work. Iron #3: White Horse (or Sunil’s Bane): In November of last year I finished up my manuscript that I was calling White Horse, though it will eventually get a new title, once I find the right one. With each novel that I finish I like to give it at least 3-4 months to stew so that I can firstly start working on something else, secondly allow myself to forget about it, and thirdly start my brain thinking about how I’m going to make it better when I start revising it. It’s now been over five months and all these things have happened and I’m looking forward to beginning the revision process. I’m going to be writing and documenting my process as I do this, updates of which can be found here, to kind of show my method, but also to lay it out in detail for me as this will be one of the biggest and most through rewrites I’ve attempted on a novel. Up until now I’d really just been reading through and rewriting a number of times until I felt it was right; now I’m employing a more methodical process to make it the best story it can possibly be. And that’s what I’ve got going on right now. Plus a couple of short story ideas floating around in my mind that I’m going to start soon, and weekly writing exercises to keep me in shape! I’ve also come up with the book I’m going to write if I do Nanowrimo this year. I’m planning to and last night worked out what I was going to write, but that will be for another post.